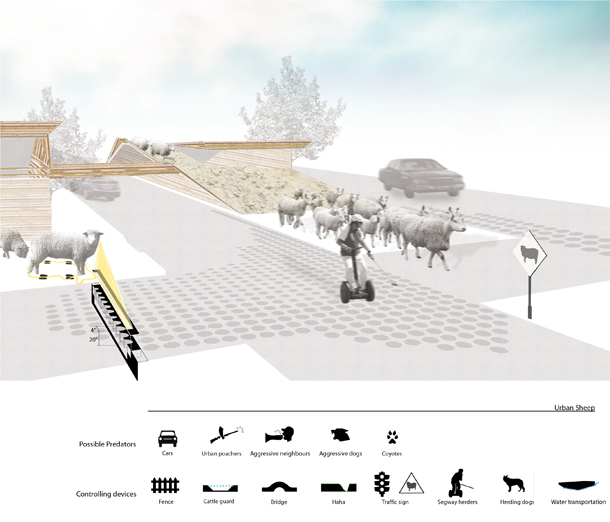 Urban Transhumance explores urban farming as viable option for urban renewal. 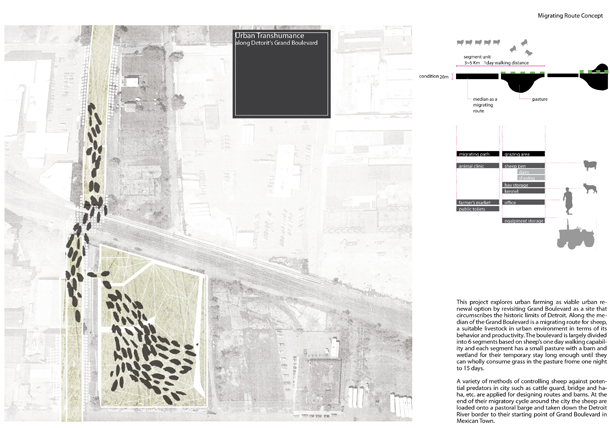 The project proposes reusing Grand Boulevard in Detroit Michigan as a linear urban farm, specifically as a migrating route for sheep, a suitable livestock in urban environment in terms of its behavior and productivity. Sheep area strong candidate-species for successful urban agricultural practices. Firstly, they are known to be relatively easy to control, sometimes docile enough to be kept in unfenced pastures. Secondly, sheep have a strong lead-follow tendency and behavior as a member of flock. Once flocking in four or more sheep, one person or herding dog can control their movement. And lastly, but most importantly they have a high-degree of agricultural value producing valuable commodities such as meat, milk, cheese and wool. 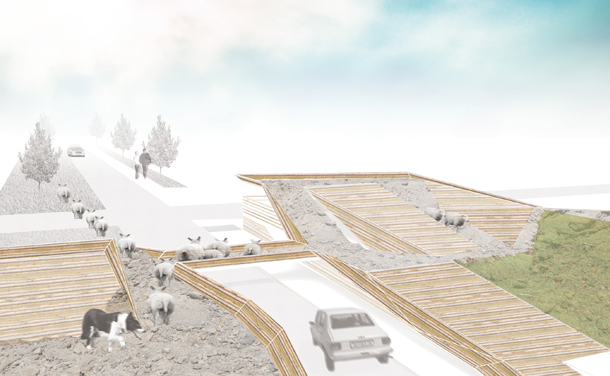 The project proposes to divide the boulevard into 6 segments based on sheep’s one day walking capability and each segment has a small pasture with a barn and wetland for their temporary stay long enough until they can wholly consume grass in the pasture from one night to 15 days. Construction materials needed for creating landscape for urban pasture are expected to use abandoned building derelict near Detroit area. A variety of methods of controlling sheep against potential predators in city such as cattle guard, bridge etc. 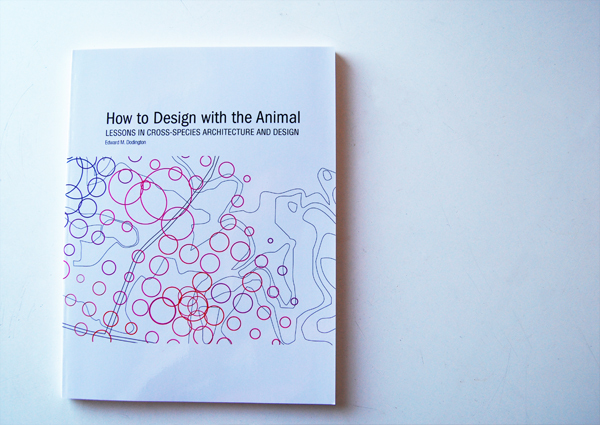 are applied for designing routes and barns. At the end of their migratory cycle around the city the sheep are loaded onto a pastoral barge and taken down the Detroit River border to their starting point of Grand Boulevard in Mexican Town. This project has tried to seek for ways that a city can be self-sufficient. In this regard, this project suggests that Detroit might returning back to agricultural economics. All facilities are custom-tailored for sheep use. For example, sloping terrain is kept suitable for sheep rather than humans, which is up to 80% slope, and designed to be rugged in order to help sheep to climb well. The rest of work is focused on how to control sheep migration in urban condition. To control sheep effectively, the project includes the research of what attracts and distracts sheep. Attractors such as new green leaves, water and shade are located in the middle of the pasture in order to safely isolate the flock of sheep from the urban disorder. Distractors such as noise and light from urban activity are designed to be minimized by adjusting floor levels and employing blocking devices such as trees and walls. As cars are the most distracting factors in city, migrating routes are designed to be separated below or above from the human traffic level. However, some locations such as intersection are inevitable for the flock of sheep to meet human traffic. Cattle guards, long been used in farms, are installed on the edge of the migrating route and block sheep to access the traffic road.